Here are several partner shooting drills. Have each player get a partner and use all of your baskets. With all of these drills, make sure your shooters are squared up, using good shooting technique, elbow in, follow through, no drifting sideways. Shooters should receive the ball in triple threat position. Make sure the passes are sharp and accurate. Players should sprint after the ball and to their shooting spots (game speed)... no loafing! Make the drills competitive and have each pair keep score. Losers do push-ups. Shooting Drill #1, Catch and Shoot. Player #1 makes a good chest pass to player #2. 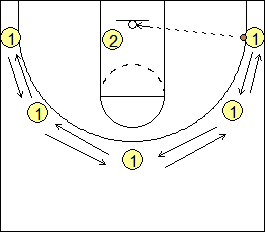 #1 follows the pass and closes-out on #2, but does not try to block the shot or simply fly by the shooter. #2 takes the shot (no dribbling)and follows it for the rebound. Now player #2 passes back out to player #1 (who is at position A) and closes-out on #1, who is now the shooter. After both players have shot from position A, they move next to position B, and on around the circle and then back around again (E->D->C->B->A). 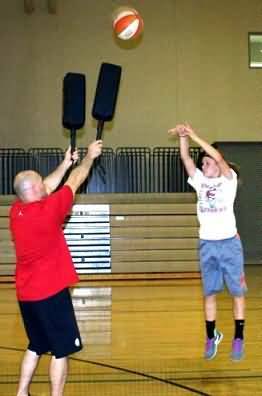 If you are coaching younger players, have them move in closer so that correct shooting form is not compromised. Shooting Drill #2, Shot Fake and Shoot Jumper. Shooting Drill #3, Fake and Drive for the Lay-up. Shooting Drill #4, Anything Goes! From "Lon Kruger: Cornerstones of Team Culture & Practice Drills"
Shooting Drill #5, Elbow Shooting. Player #1 is the re-bounder for player #2. #2 starts at the left elbow, fakes left and cuts to the right elbow. #1 passes to #2 so that the pass arrives at the right elbow the same time #2 does. #2 plants the inside foot, squares up and takes the shot. Make sure that correct shooting form is being used and that the shooter does not "drift" sideways. #1 rebounds the shot and passes back to #2 for the shot now at the left elbow. #2 continues moving back and forth from elbow to elbow for a total of ten shots. Then the players switch roles and #1 is the shooter for ten shots. You can repeat this for as many sets as you want, getting 20, 30, 40 or 50 shots for each player. Shooting Drill #7, Bird Shooting Drill. This is a difficult drill. Use two players... one a shooter and the other a rebounder. As a team drill, we use all of the baskets. We shoot from 5 spots on the perimeter - 3-point shots for outside players, while post players can move just inside the arc if desired. Set the clock for 2 minutes. On "go", the shooter starts in the corner and must make two-in a-row before he/she can move to the next spot (the wing). The shooter must make two-in-a-row at each spot before moving to the next (see diagram). Rotation is from right corner => right wing => top => left wing => left corner => left wing => top => right wing => right corner. If the shooter makes it all the way around and back, he/she then goes to the top and starts shooting 3-point shots from there, and however many he makes from there (total, not consecutive) is his score... so 2 or 3 is a really good score. Next, the rebounder becomes the shooter (and vice-versa) for the next two minutes. This is difficult because there is pressure on the shooter because of the 2-minute time limit, and because of having to make two-in-a-row at each spot. You could shoot 50% and never leave the first spot! With all of these drills, make sure your shooters are squared up, using good technique, elbow in, follow through, no drifting sideways. Shooters should receive the ball in "triple threat" position. Make sure the passes are sharp and accurate. Players should sprint after the ball and to their shooting spots (game speed)... no loafing! Make the drills competitive and have each pair keep score. Losers do push-ups. The Swish Video/DVD and the new "Swish-2" DVD, by shooting coach Tom Nordland.